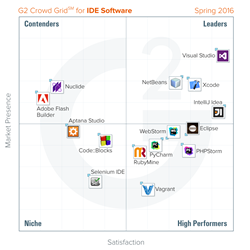 G2 Crowd, the world’s leading business software review platform, today released the Spring 2016 IDE Software Grid report to help businesses make the best Integrated Development Environments (IDE) technology decision. Visual Studio, IntelliJ IDEA, Xcode, and NetBeans were named a Leaders in the report, receiving strong customer satisfaction scores with a large market presence. Eclipse, PHPStorm, WebStorm, PyCharm, RubyMine, and Vagrant were named High Performers in the report, earning strong customer satisfaction marks with smaller market presence scores. IntelliJ IDEA earned the highest overall satisfaction score, while Visual Studio earned the highest overall market presence score. IDEs are heavy and slow – Reviewers complained about usage and lag with nearly every product included in G2 Crowd’s Spring 2016 IDE Grid℠ Report. The complaints include slow startup times and installations, laginess, freezes, and crashes. Users repeatedly recommended using computers with significant RAM space to combat these issues. Large market for small business and personal use – More than half (54 percent) of the reviewers included in G2 Crowd’s Spring 2016 IDE Grid℠ Report used the product at either a small business or for personal use. When only including free and open-source products, the average jumps to 61 percent. Cross-platform desires – Major complaints for platform-specific IDEs were often related to their operating system dependency. Some programs focused on Apple or Windows development were limited to that operating system. But many users wished to use the products across Linux, Solaris, Windows, or Mac operating systems. Specific use focus – Many of the IDEs included in G2 Crowd’s Spring 2016 IDE Grid℠ Report were focused on development either with a specific language or for a specific purpose. Most products were geared towards PHP, Java, Python, and .net, among others. The report is based on more than 410 reviews written by business professionals. Of the roughly 62 products listed in G2 Crowd’s IDE category, the ranked products each received ten or more reviews to qualify for inclusion on the Grid.